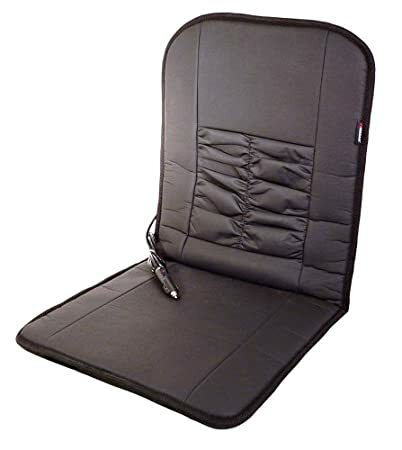 I bought this heated seat cushion from Amazon because my 2011 Nissan Leaf uses a LOT of power for heating. It's very inefficient. To see how a heated seat cushion worked, I bought a cheap one. It has no thermostat or switch of any kind. You plug it in and it gets hot. So far, I'm impressed with how much heat it puts out. After a while at an outside temp of 42, I had to unplug it. It stays warm a while because it's fake leather and so it doesn't breathe much and the heat stays trapped. I wish I'd spent a bit more and gotten this one, but the point of the story is that you will be surprised how much heat you get, and how much battery you can save, for under $20. Update: I lost a few bucks in shipping to return the top seat and got the one in the second link. Buy yours through that link and help me get a commission to make up for my mistake. And avoid one for yourself.